The Port Bay Barrier Bar is a narrow strip of land that forms a natural divide between Port Bay and Lake Ontario in Wayne County, New York. This dynamic coastal feature keeps the waters of Lake Ontario from entering Port Bay, which is bordered by seasonal homes and serves as habitat to aquatic species. In recent years a breach has occurred in the east barrier bar, raising concerns that wave action and ice and debris transport could cause property damage and impact fish and wildlife habitat. 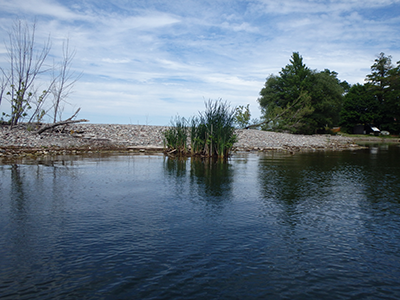 To make a science-based decision on how best to manage the east bar, NYSDEC hired EcoLogic as part of a team led by Bergmann Associates to assess conditions and develop and evaluate alternatives for responding to erosion and breaches. EcoLogic is responsible for the assessment of Port Bay’s biota, habitat, and water quality conditions, and for technical editing of the project report.